No matter your floor plan, this Prepac TV stand will fit right in. Easily accommodate 51-inch to 60-inch televisions with the black free standing TV stand. This TV stand is great for storing movies, gaming consoles, and speakers. If you have a small space, take advantage of the Galaxy 50 inch Compact TV Stand with Mount to display your television. This TV stand features a space-saving design, perfect for smaller apartments, bedrooms or studios. It still, however, has two shelves to hold your gaming consoles or AV components, and you can store DVDs in between the two shelves. The back panel allows you to keep wires organized, and a sleek finish enhances your homes contemporary style. Assembly Required. Perfect for small spaces, the Layton Wall Mounted 47 TV Stand provides you with storage and organization. The modern floating design features 4 open shelves for your cable box, DVD player, gaming systems and for storing DVDs, books and other media. The wire management holes prevent your cords from becoming an eyesore, while sliding back panels give you easy access to outlets and power strips. The Black Oak finish creates instant style in your room! 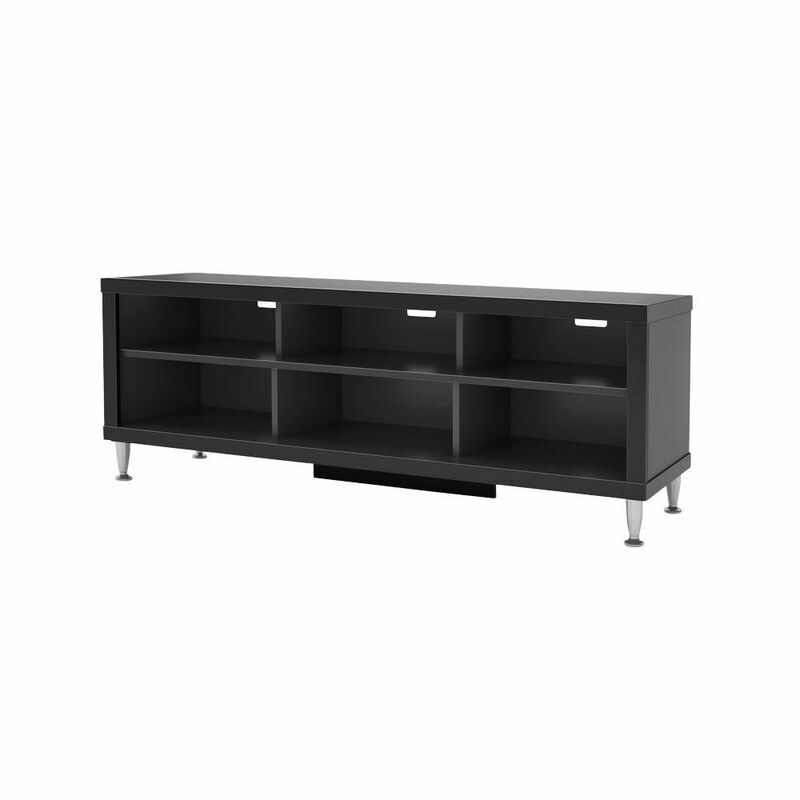 Designer Series 9 55-inch x 20.25-inch x 15.5-inch TV Stand in Black No matter your floor plan, this Prepac TV stand will fit right in. Easily accommodate 51-inch to 60-inch televisions with the black free standing TV stand. This TV stand is great for storing movies, gaming consoles, and speakers.